There are so darn many pop science overview books out there. This is a particularly good one. The author has made a career of promoting science to the general public, he's done TV, radio, and previous books, and he's got it down. He expects his readers to be intelligent and to think but he doesn't throw a lot of equations at them. He comes up with clever and accurate metaphors that have not been done to death, and the hand-drawn illustrations are attractive and genuinely helpful. Excellent book. Intended audience, layperson with an interest in mathematics and science. Marcus du Sautoy is a renowned mathematician who looks at 7 areas of knowledge that mathematicians and scientists don't know. I liked how hear clearly explained topics in mathematics and physics.Wherever Dr. du Sautoy dealt with topics close to mathematics, he was excellent. Other areas, in partucilar, consciousness, was too hazy, almost too pop-science. If the reader listens to a few Brain Science podcasts by Virginia Campbell, they'll get better, more solid information about this topic.While Dr. du Sautoy is an atheist, he exhibits a gentlemanly respect for others who hold various religious views. I find that refreshing (now I am biased because I am a confessional Reformed Evangelical Christian). In philosophy, I think Dr. du Sautoy did a reasonable job. But he takes a narrow slice among his Oxford friends. There are others to explore, such as Alvin Plantinga.On the topic of the multiverse, there are some issues dealing with infinities that, in my opinion (not that it's worth much), should be examined. One is the issue of what would be a typical observer in an infinite multiverse across all time. Ludwig Boltzmann raised the issue that we would be far from typical observers that we'd expect in a multiverse.Overall, the book was excellent. I enjoyed it very much. An awe-inspiring journey through some of the boundaries of our knowledge today. While a self-described atheist, du Sautoy seems to endorse the idea/potential for God as a transcendent force outside our reality. Visited seven edges:Read 06/16/2017 while on Oregon vacation 1. Edge 1. Chaos. Small changes in starting conditions can have enormous changes in results. We cannot have precise knowledge of everything (down to electron positions throughout the universe.) Everything is connected. =============2. Edge 2. Matter. Is it continuous or discrete? Are quarks the smallest or is matter further divisible? Unsure. Amazing journey of exploration and discovery. Great symmetry in nature. Allows strong predictions. Current quark model seems to be complete but unknown below that. =============3. Edge 3. Quantum Physics. It is completely random (e.g. Radioactive decay). No determinism. Observation can inhibit the progress of a quantum system. The past is also a superposition of possibilities that only crystallize once they are observed. The act of measuring seems to determine the properties of a particle. Einstein called Quantum entanglement "spooky action at a distance". =============4. Edge 4. The Universe. Can we use light to determine the curvature of the universe and whether it is finite or infinite. The universe is expanding. (Due to dark energy). One implication, galaxies we could see are going to be pushed beyond the the edge of what we can see. Eventually, only our galaxy will be visible. Currently, we believe 18b light years is the cosmic horizon limiting our observations.1. Don't currently have a good way to explain the ~20 constants of nature that allow life to exist. Multiverse is one potential explanation- there are a bunch and ours happened to be right.2. John Barrow, Cambridge professor - won the Templeton Prize (connecting science and religion). Studies limits of our knowledge. Check out his books. Can never prove a theory is correct, only that it is incorrect. 3. Key question- is the universe finite or infinite?=============5. Edge 5. Time.1. Two bodies moving a different speeds relative to one another will both sense that the other's clock is moving slowly. Must think about an integrated concept, space-time. Special relativity.2. Impossible to tell the difference between gravity and acceleration. Same effects. Big implication: high gravity slows time, just like acceleration does. General relativity: gravity and acceleration are woven into space-time. Basically, things with MASS. 3. Heisenberg stated that both position and momentum cannot be precisely determined - one or the other. Same with time and energy - choose one. 4. Roger Penrose- imagined model of Bib Bang being a continuous connection of universe expanding, followed by contracting. Each cycle called an eon 5. KP: what if black holes are the seeds of a new universe that will be launched (and continue to expand)?6. Edge 6. Consciousness. Have been trying to understand for centuries. Only with recent tools has our understanding started to grow quickly. In past, structural damage allowed people to see effects. Two hemispheres seem to be somewhat independent maybe redundant. fMRI and EEG are the tools used but they assume homogeneity among brains.1. EEG measures electrical activity in the brain by recording voltage fluctuations from electrical currents among regions of brain. There are 5 speeds of waves that are associated with different brain activity.1. Delta waves. 1-4 Hz. Deep, dreamless sleep 2. Theta waves. 4-8 Hz. Light sleep or meditation 3. Alpha waves. 8-12 Hz. Relaxed wakefulness 4. Beta waves. 13-30 Hz. Wide awake 5. Gamma waves. 30-70 Hz. Formation of ideas, language and memory processing and various types of learning.2. fMRI detects changes in blood oxygenation in brain areas. Oxygenated blood is more magnetic.3. Fun little experiment: look through paper tube with one eye and look at far off object with both eyes. Will see a hole in your hand.4. Look up McGurk effect on YouTube. See face making sounds but you won't hear them because they switched the soundtrack.5. Look up Ehrsson experiment with a fake hand and real hand behind a screen. Stroke fake and real hands simultaneously and people will start to believe it's their own hand.6. Mind-body problem. Is consciousness separate from our physical body? 7. Networks that are tightly connected but differentiated. High symmetry seems to not be associated with consciousness. Lots of feedback and connectivity is good. Key structural elements: connectivity, feedback, differentiation.8. Consciousness seems to be nonlinear, like a phase transition- all or none, not gradual. Does this mean that our attempts to create a computer consciousness will not be rewarded with partial success (an idiot but conscious)?=============7. Edge 7. Infinity.1. Gödel proved that mathematics is not free of contradictions. Mathematics is open to falsification. In any system, there must be true formulas that are neither provable or disprovable. Corollary: the consistency of a logical system cannot be proved within that system.2. Georg Cantor - 1890's, did work with infinity to show that different infinities are equal. E.g. Whole numbers and fractions. Did it by matching things up and showing you didn't run out. There are infinite infinities. The mathematical establishment of the day shunned him.3. Does Gödel's incompleteness theorem mean we cannot know some of these things since we are inside the system? You cannot step outside the system to prove it because the theorem is an infinite regress... 4. Does a transcendent God stand outside the system? By making God flesh, are we trying to make the unknowable knowable? That seems counter to the concept of God.9. Summary.1. It is possible that we cannot know because we are stuck within the system we seek to understand.2. Our physical limitations will place boundaries on our knowledge.3. "The trouble with most religions is that the God that is served has so many properties that have nothing to do with the definition." 4. Frederic Fitch. Paradox of unknowability: "Unless you know it all, there will always be truths that are by their nature unknowable." 5. Stephen Hawking: "The greatest enemy of knowledge is not ignorance but the illusion of knowledge." Very interesting to think people before us have thought everything had already been discovered in areas such as physics. It was an interesting read, but some parts were quite complicated with the formulas. The real world examples explaining the formulas were nice. This is a great book for parents to read so they can explain to their kids how things like calculus apply to the real world. Math is a very hard subject for me so while I found some parts difficult it also gave me a greater appreciation for the subject. A must read for those concerned with the future of education and general survival. I'M SORRY THAT I've finally finished reading this after 4 months of winning it from giveaway. So I kinda got a new job about the same time I won this, which was a coincidence! Anyways, after finishing the book, I quite enjoy the read. I do stand by my previous comment below about the history of discoveries, as the book gives an exciting narration of scientific discoveries, up to what we don't know at the moment. While the book did touches on the topic of God or religion, they only play a small part of the book's narration. There might be scientists or philosophers or logicians in history who were religious, there were also those who weren't. In the end of the day, in the quest to expand what we know about the universe, we might have to use every tool available. The author also mentioned mixing of the science and the arts in the final chapter, as another tool of finding more about what humans don't know yet. As society seems to be pushing STEM focus fields, it's a nice addition to see that perhaps, we might have to bridge both science and the arts to find a train of thought that helps us see the universe better. (ok it's like time for bed I might be rambling)~~I'm only on page 90 ish, but i really like it so far. The book isn't overly complex, and go over the history of how certain discoveries were made. (I have no idea that Newton was alive at the same period as bubonic plague lol). This isn't a book to teach you how to solve calculus step by step, but it's a book that explains what we know so far in years of science discovery, and what challenges are ahead of us that we humans still can't wrap our heads around yet.I also like how the book touches on discoveries made by people before, despite what a certain discovery is commonly associated with a certain person. This is a hugely absorbing and eminently readable account of just where the limits of scientific knowledge currently are in relation to seven areas of inquiry: Chaos, Matter, Quantum Physics, The Universe, Time Consciousness, and Infinity. The current Simonyi Professor for the Public Understanding of Science and a Professor of Mathematics at the University of Oxford, Marcus Du Sautoy, presents some of these well-known challenges in fresh new light, coming from a highly respected mathematician instead of a physicist or biologist as is frequently the case. The result is a current appraisal of our known-knowns, known-unknowns, and suggestions as to where our unknown-unknowns might be lurking. His knowledge across several fields is vast but there is obviously in a work of this magnitude some unevenness, not surprisingly given his mathematical research, the chapter on Infinity is his finest. This is great fun and hugely education reading for our current state of scientific epistemology as well as some meanderings into information science ontology with respect to our relationship with artificial intelligence. Great stuff! This is pop science taught with purpose!A typical popular science book would explain scientific evolutions chronologically and through the life experiences/assertions of key scientists. This is where this book differs completely and in the process becomes extremely readable.Through chaos theory to quantum uncertainties, infinities and neuroscience, relativity, cosmology, the incompleteness theorem, AI and the rest, the author finds a great way to introduce many scientific concepts by pivoting the discussions on what is unknown or unknowable to us as of now. Mr Sautoy is a good writer, which helps tremendously in covering such a diverse range of topic as well. The book is full of beautifully laid out nuggets of explanations - which would enthrall and exhilarate those familiar with these theories too.The book definitely moves way too quickly and covers all subjects only perfunctorily. Yet, a great read for the way it is laid out. This is a well put together synopsis leading to the frontiers of knowledge on engaging mysteries like the Quantum world, Cosmology, Relativity and Time, Consciousness and Infinity. You know science's good stuff. The kind of stuff philosophy people can chew on. In other words the really fun stuff in science or the big questions. The author is engaging and balanced in his views and a delight to read. It got four stars cause I am a bit jaded and covered the material before but he does an excellent presentation and if I had picked this book up without reading on this topic before I would have given him five stars. Absolutely loved the first 6 "Edges" because I was more comfortable with the material. I got lost in the discussion about infinity because I was listening to the book rather than reading it. As a Christian myself I really thought that he posed some interesting questions and treated each subject with fairness and objectivity, recognizing when we have to make assumptions. The topic of what we cannot know implies a level of humility that is inspiring and refreshing in this world of increasing polarity. I highly recommend it to anyone that enjoys wading through science and philosophy (in surprisingly equal parts) in their free time. This book is du Sautoy's attempt to accessibly summarize the state of knowledge about big and currently unanswered questions: the size of the universe, the nature of time, where consciousness comes from, and the like. He gratingly calls each of these questions a capital-E "Edge," and likes to periodically interrupt whatever he's talking about with a "but I still don't understand this! How frustrating! Isn't it confusing?" soliloquy. Despite these tics, the book was mostly pretty readable; I don't know that I came away much more enlightened or awed by the glories of science, but it was not something I regretted picking up by any means. Goes through how scientists have ended up with the current theories about chaos, matter, quantum physics, the universe, time, consciousness and infinity. On the aspects we remain ignorant about, which are plenty, he explains some possibilities, along with whether or not we might be able to fill the gaps. Fascinating. The author is a mathematician and goes through the logic of some of it; I appreciate mathematics as a tool but I find it rather irritating by itself. However, that's a problem with me and my limited brain. The seven journeys are referred to as edges in the book and he covers chaos, matter, quantum physics, the universe, time, consciousness, and infinity. This book is not so much the frontiers of science as much as the frontiers of physics and math (save for the section on consciousness).I had learned about most of the edges in my lower division university math and physics courses, but it was really interesting to read more about the history and the impact of the discoveries. I thoroughly enjoyed the first 5 edges; consciousness and infinity are not topics I am particularly interested in, but still informative. This is the kind of book I wish I had read when I started college, I would have paid more attention in my math and physics classes. du Sautoy explores seven "edges" of mathematics and science and asks: can we definitively prove with the tools of mathematics there are truths we can never know? Overall, du Sautoy does a remarkable job explaining and addressing the knowns, the known unknowns, and the possibilities of the unknown all while guiding the arguments with historical context, modern elucidation, and informed prognostication. Some "edges" are stronger than others, but in total a well written and entertaining read. Interesting exploration of critical ideas we can never be sure of from a scientific and even mathematical point of view, such as origins. Includes what we do know in the various areas, and why we can never know. Several atheistic explanations of why God in not necessary, such as the reason why our universe is so orderly and fit for human life. Our universe must just be one of billions of other universes. Pretty tricky, but zero evidence. Interesting study of what we cannot know - Or can weYou will need a high knowledge of basic math and science to enjoy this book but you probably won't buy it if you don't. It is a well written tour of what we know we don't know and what we may not be able to know. I definitely enjoyed his writing style. Heavy topics, even with my math and science background. Author does his best to provide relatable analogies and he provides interesting history to help explain the thornier points. It ended up having more discussion of religion than I was expecting but it was very open-minded, which was nice. It's the kind of book you need to sit and think about, not just breeze through. Math is AN AnswerMath has an answer to many of its "problems," but reality/LIFE is so much more than math. Math is a powerful tool of the human mind, AND reality is greater than math. However, the author believes it is the answer to EVERY question of the human mind. Not exactly. Sorry, no. Great book that takes the reader through a journey of smallest to largest concepts in physics and mathematics. I had to read it twice to grasp some of the concepts and still I feel I can read it over again after I’ve mulled them in my head. Mind blown. Imponderable concepts! Sometimes the reading felt like homework in a college level math/physics class; I had a lot of trouble comprehending it. The author used some humor, which helped get me through the dry parts. 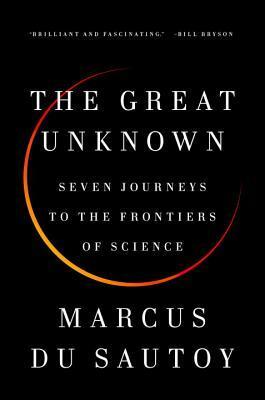 I could see The Great Unknown being really enjoyable to someone interested in science, but without too much background in it. I guess I've considered / read about most of the concepts discussed in the book, so it wasn't particularly exciting. 3 stars for me, probably 4+ stars for others. This one left me a little cold. Du Satoy's writing is long-winded, not terribly clear in important places and failed to make me really care about the "seven journeys". Which is surprising because it's something that I'm very interested in - the limits of knowledge and all that. Read This Book!This book is a fascinating survey of what we know and what we do not know and perhaps will never know. Have reached the edge of human knowledge or will we move on and discover new limits to human knowledge? What are current boundaries of our scientific knowledge? Is there an end to the universe? What is the most fundamental particle? Du Sautoy explores these and others. This is a deep book with a number of complicated issues that are wonderfully presented. Very helpful walk on the edge of the possible. This is well written. Using a die as a device to pull these seven topics together is brilliant. Lovely way to get a sense of the biggest challenges in the sciences today. Would've been a Hell of a lot easier to follow along with the equations if I'd had a physical book to see them! Marcus du Sautoy - Marcus Peter Francis du Sautoy, OBE is the Simonyi Professor for the Public Understanding of Science and a Professor of Mathematics at the University of Oxford.